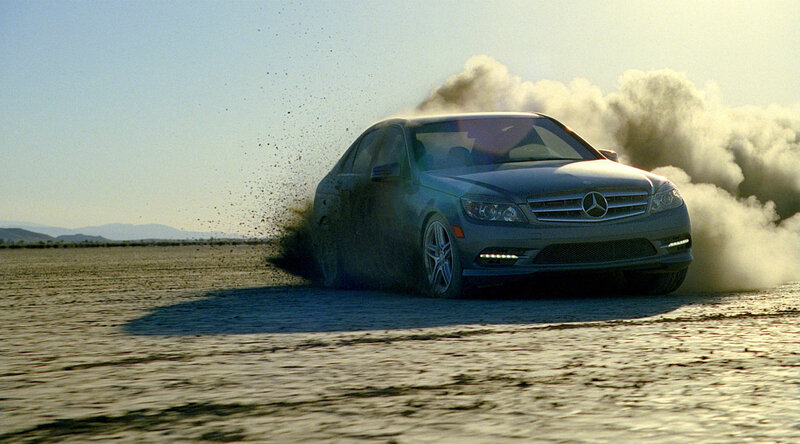 The Mercedes-Benz C-Class has panache. With desert doubling for a closed driving course, Merkley+Partners’ new spot 'Disclaimer,' depicts three cars’ precision handling and control as they dodge and weave in close proximity to the others. Three lawyers appear juxtaposed throughout the course, confidently narrating the driving extravaganza that only the C-Class could pull off. Although the cars and lawyers seamlessly interact on the desert course, things are not quite what they appear to be. "We shot them separately and combined plates," explains Iwan Zwarts, The Mill's VFX Supervisor and Lead Flame on the job. "Carl Erik Rinsch [the director] was great to work with because he's very savvy with timings. In one scene, where the cars speed toward each other in what at first seems like a crash course, he nailed the choreography in one take. It's tricky because you have to start on a mark, reach a certain speed and then hit another mark. There are a lot of variables." Zwarts explains that dust cannons were used to elicit reactions from the actors so they appear to be interacting with the cars racing by them. On location, he filmed elements such as dust on the Canon 5D Mark 2 that were added to all the plates combined in Flame. Round-the-clock car cleaners were on hand because the cars had to be rotated for cleaning after two takes. "Working on a big production, with helicopters, motion control and miles of desert, and the occasional threat of a sand storm, is not your average shoot," Zwarts relates. "In the end it was a perfect convergence. Merkley+Partners and RSA were great collaborators."